You can love or hate it (or perhaps both? ), but most of us agree that planning and building a product backlog is painful in Azure DevOps. There is no good place to map the product when starting it from a scratch. Creating user stories is slow and rearranging the work items is complicated. There is no intuitive layout to see the big picture, and the only thing you have is the old-school flat backlog. Building a product backlog in StoriesOnBoard is an easy-to-use solution for these problems, but copying the backlog manually into Azure DevOps was time-consuming and frankly, annoying as heck. From now on, you can import your backlog to Azure DevOps instantly, and you can push backlog items to an agile project with a single click. The fast story writing features and the real-time sync will save you a lot of time to boot. I wrote “hierarchy synchronization” above. What it actually means, is that you can assign top level cards to epics, second level cards to features and third level cards to user stories. After connecting the story map you can push all your items to Azure DevOps and they will take their place on the right level. Moreover, they will change their type when rearranging them on the story map. If the hierarchy sync doesn’t fit the project, you can turn off the feature and choose manually. 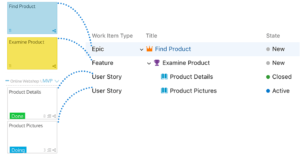 Ok, you rarely start a project from a scratch, but you can rebuild a product’s backlog on empty story map with just a few clicks. Thanks to the hierarchy sync, every item will take the right place. Sounds easy, right? The import works well on an existing story map too, you just need to pay attention to duplications. StoriesOnBoard separates imported cards from the existing elements. Tip: Enable editors to import cards – this will open an import shortcut on top toolbar. There is no more missing details and no more copying. After setting up the integration, the details of the synced cards are updated no matter where you changed them. 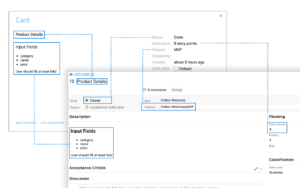 You can add a detailed specification to a user story during planning, and it will appear in Azure DevOps too. 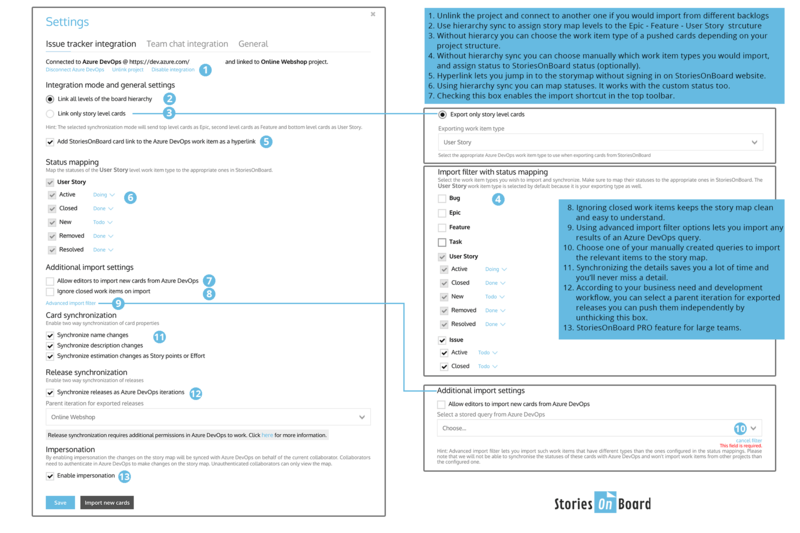 StoriesOnBoard’s markdown formatting and Azure DevOps text formatting features are also synchronized, so your specifications remain looking nice and neat. Projects, workflows, and team rules can be different. We’re working hard to deliver the right solution for every project need. So, you can link all Azure DevOps status’ to a story map status manually if you like. This also works well with a custom status too. Without hierarchy synchronization you can enable the status updates of imported bugs, issues and tasks too. In addition, your release exports are also customizable, so choose the right iteration level depending on your business needs. 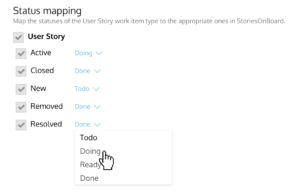 When the status of user stories are synchronized you’ll always be able to go back to the story map and take a quick look on the project, or on the current iteration. Status reports are there to give a visual insight into the developer team’s work. 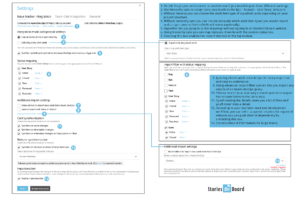 Status reports could always be more sophisticated when using story points on user stories, but remember that story points are also synced and updated back and forth. Story maps are a visual aid for customers (and also for executives) who can’t dive into the details, and just want to review the project. Azure DevOps offers numerous opportunity (dashboards, widgets etc.) to create reports, but it can be a bit scary for those not involved in the development process. A story map can be a more pleasant visual platform where your customers get a closer look at the project. They can open status reports and leave comments if they like. They don’t even need to sign up for the product. Thanks to hierarchy, description and status sync, you don’t even need to take care of creating these reports for your customers. 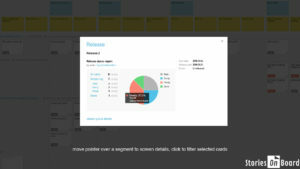 When using MoSCoW releases, it’s always easier to prioritize and estimate user stories on the story map. During a preplanning session, you can easily create a new iteration on a story map, and drop the highest priority stories into it. 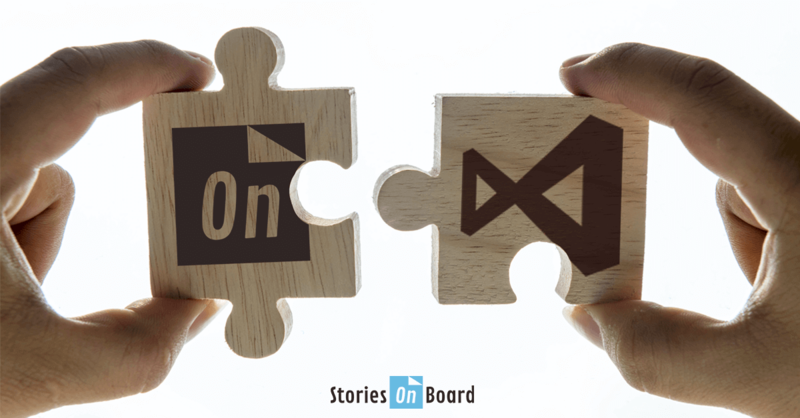 After pushing user stories to Azure DevOps, you can also break them into smaller tasks. 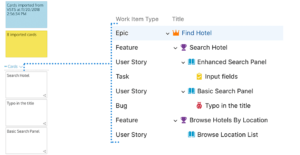 Tasks are related to day-to-day work and contain mostly operative details, so removing them from the story map keeps the high-level overview of the product. You can push new stories to Azure DevOps release by release, so your agile project won’t be flooded with ideas and unprioritized stories.